The world anxiously awaits 20th of March 2018, the very date the Presiding Judge of the Nigerian Federal High Court Abuja, Justice Binta Nyako will be appearing once again because of Biafrans. She resumes sitting on the case of treasonable felony preferred against Mazi Nnamdi Kanu and other Biafran detainees in Kuje Prison. Biafrans the world over, under the umbrella of the Indigenous People of Biafra (IPOB), ably commanded by the supreme leader, Mazi Nnamdi Kanu, are unequivocally calling on the Chief Judge, to learn from the provisional ruling of the African Commission on the petition written and forwarded to it by the Indigenous People of Biafra (IPOB) worldwide, against the Nigerian government. They requested that Justice Binta Nyako should act expeditiously according to the law by granting bail to Mazi Benjamin Mmadubugwu, Mazi David Nwawuisi and Mazi Chidiebere Onwudiwe, who have intentionally being denied adequate trial for years now. In the provisional ruling of the African Commission, the Nigerian government was pointedly directed to totally and completely put on hold, further actions against the IPOB as Indigenous People and Mazi Nnamdi Kanu as an individual, pending the final ruling on the petition lodged before it by the IPOB. With this provisional ruling therefore, the Nigerian government on the 8th of March 2018, being the date of the Commission made this pronouncement, was given up to the 15th of the same month, to send in to the Commission, the procedure of compliance to the order. It could be recalled that these three (3) Biafran detainees have spent nearly three good calendar years in unjust incarceration in the hands of the Nigerian government without trial. But as separate trials hopefully commence on the 20th of March 2018, Justice Binta Nyako will most definitely be standing in-between her conscience and justice by releasing them on bail from illegal captivity. Now that the African Commission has clearly given this provisional ruling to Nigeria with an attached ultimatum of 15 days for the submission of her planned method of compliance, it is expected that Justice Binta Nyako will redeem her bartered image and judicial respect, in her efforts to service the interest of the Nigerian government, by conversely doing the needful. Mazi Benjamin Mmadubugwu, Mazi David Nwawuisi and Mazi Chidiebere Onwudiwe must of necessity be granted bail as she did to Mazi Nnamdi Kanu before the Nigerian Army invaded his residence and got him abducted on the 14th of September, 2017. 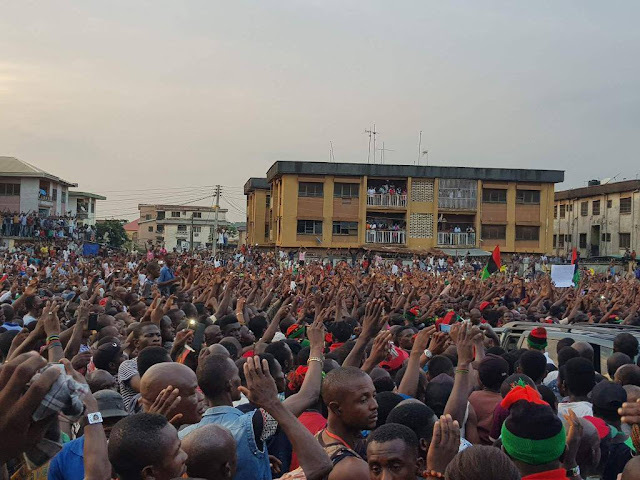 It is pertinent here to draw the attention of Justice Binta Nyako that granting bail to these detainees and other Biafran agitators does not in any way signal the end of the case but just a display of definitive approach of dispensing justice to the deserving. This is the only wise decision she needs to come up with so that the Nigerian government can proceed to prove the preferred case she levied against these agitators. The African Commission has unambiguously, created a judicial template for Justice Binta Nyako to learn from and salvage her professional career as a judge. She needs to quash all the immoral and despotic scripts handed over to her by the Nigerian government to dramatise with. The expectations of all human rights and justice lovers all over the world are presently heightened as these detained Biafrans await their bails. The ball is definitely in the court of Justice Binta Nyako to play with accordingly. She has to very expeditiously and eternally extricate herself and her family from damnable blackmail and shame. THIS ADVISE SUFFICES FOR THE WISE!